Theatre With a View perform at Sycamore Hill estate in Pottstown in 2017. As big as all outdoors. Summer is the season for outdoor theater. But it's more than blankets and bug spray. For performers, too, it's a different theatrical universe. J. Hernandez is playing Benedick in Much Ado About Nothing, through July 29 at the Delaware Shakespeare Festival. "Some actors," he says, "do douse themselves with bug spray, and even sun screen" – performances at DSF start at 6 p.m. on Sundays and 6:30 p.m. on weekdays, when sun is still a factor. "The main thing is to drink water. You can dehydrate very quickly." Perhaps the biggest differences from indoors are the need to project, and the greater energy required for physical theater. "You can hit the wall fast," Hernandez says. "It can be an endurance contest." Jack Tamburri is directing Twelfth Night, complete with local rock band, on July 25-29 for this year's Shakespeare in Clark Park. For him, outdoor Shakespeare brings it all back to truly old-school values. "For much of his career, Shakespeare was writing for outdoor, often rowdy crowds, in the midst of big distractions," Tamburri says, "and actors of his era were incredible masters of commanding audience attention. They had to be. Today's actors are used to polite audiences indoors. It's a fun challenge to mix the physical work with the emotional storytelling most American actors have been trained to be good at." 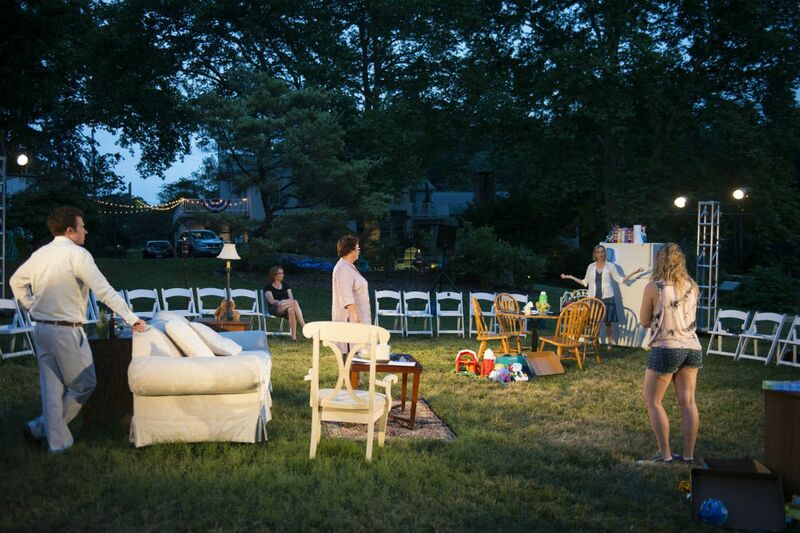 And out in Pottstown, Theater With a View again offers a play at night at the beautiful Sycamore Hill estate. This year, it's the hard-hitting On the Exhale, a one-woman show about the issue of gun violence. "It's exhausting," says Nina Covalevsky, that one woman, and the troupe's founder, "from a concentration standpoint. I have no other actors to take up the energy for me." "You have to give yourself over to the environment," director Elaina Di Monaco says of playing outdoors. "There's so much you can't control." During rehearsals recently, fireworks erupted three or four houses away. "Well, you can't ignore it," Di Monaco says, "so we acknowledged it, 'Oh, there's fireworks,' and we kept going, kept telling the story."